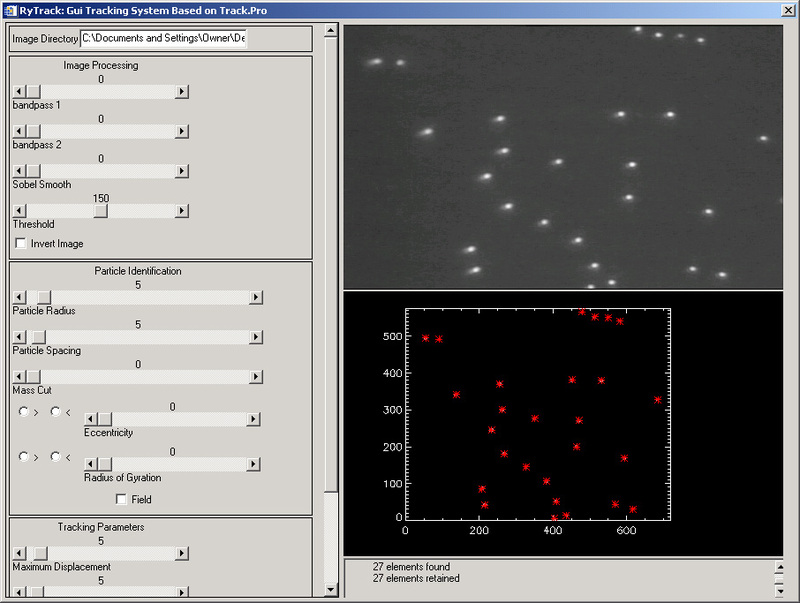 RyTrack provides a front-end GUI-based particle tracking interface that incorporates popular routines (see "Particle Tracking in IDL" at http://www.physics.emory.edu/~weeks/idl/ ), with the intent of making the entire process friendly enough that users need not learn (or even own) IDL or MatLab or any other similarly expensive, difficult to learn programming tool. For example, you might have every student in your sophomore-level courses use this to quantitatively analyze Brownian motion from images that the students themselves capture. -- If you do use this for instructional purposes, please share your laboratory write-ups with us and we will post them to this site. RyTrack enables users to preview the effects of applying (via simple slider bars) various filters to an image, and to then test, on a sub-set of an image sequence, how well particle location routines can select out the features of relevance. Once a user is satisfied that their slider bar settings will yield successful particle recognition and location, a simple mouse-click will extend the processing to the entire image sequence, at the same time tracking the motion of individual particles as they move from image to image. Before use, you are advised to consult the introduction to particle tracking located at http://www.physics.emory.edu/~weeks/idl/ . Again, RyTrack is largely based upon the software available at that site. (ryans09 'at' gmail 'dot' com) or Gabe Spalding (gspaldin 'at' iwu 'dot' edu). RyTrack.pro : This file, which can be opened by any text editor (e.g., Microsoft WORD), contains all the documentation for RyTrack. If you have a full version of IDL installed on your machine you may use this file directly so long as you also download the subroutines in the following trackerpack.zip. Otherwise, this file serves as the single source of documentation for RyTrack, and you will also need to download RyTrack.sav (below). RyTrack.sav : This file is a (nearly) stand-alone version of RyTrack for use by anyone without an IDL license. To use it, you will also need to download the (completely free) "IDL Virtual Machine" from the RSInc Website. IDL VM provides the full benefit of many software packages that have been developed on the IDL platform. Again, if you will use the IDL Virtual Machine to run the software, you should still download both RyTrack.sav and RyTrack.pro here (though you will have no need for trackerpack.zip). RyTrack.pro (which can be opened by any text editor) contains important documentation and information on how to use RyTrack. To use RyTrack, simply open IDL VM and locate RyTrack.sav in the subsequent dialog box. If you are looking for an alternate stand alone software package written in Labview for particle tracking (especially tracking of multiple species), check out Graham Milne's freely available software.